MARINGO is Application Development Partner, i.e. 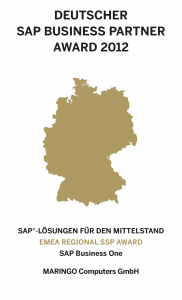 we develop solutions in close cooperation with SAP. We are also SAP Channel Partner for SAP Business One. MARIProject has been certified by SAP for integration with SAP Business One on HANA. This certification confirms the existence of product features in accordance with SAP certification procedures. In addition, MARIProject has been certified by SAP for SAP Business One. This certification helps customers to identify partner add-ons that are based on rigorous quality standards of SAP and are designed for rapid and reliable implementation while ensuring integration and interoperability.